Not many people can boast of having a family of more than 60 people, seeing them daily, chatting to them, knowing their problems and having a special place in their heart for each one of them. It sounds impossible but Wendy Bezuidenhout (59) has a family like this, and she looks forward to each day with a smile on her face and purpose in her soul. Wendy is the administrator at Le Domaine Care, a position she has held since late 2016, and, when looking at how her life has unfolded, this is one example of everything turning full circle and falling into place. She is 100% local, born at St Mary’s Hospital in Mariannhill, attending school in Pinetown and Westville and growing up in Sarnia and Manors. On completing school, Wendy decided on a path of nursing, moving into res and beginning her training at Entabeni Hospital. Wendy worked for a while as a dental assistant and then entered the corporate and commercial world where she worked her way up the ladder. However, her calling to nurse never left her and she always believed that one day, when she was in a position of stability and security, geriatrics was an area she wanted to volunteer and work in. And here Wendy is today, where she imagined she would be, surrounded by and caring for the elderly. Wendy’s husband John, is one of the shareholders of Le Domaine Care and he had pleaded with her to come and run the show as the centre needed her strong operational and organisational skills. But it was not until October 2016 that Wendy made the massive step of leaving the corporate world and joining Le Domaine Care. After some adjustment, she now proudly runs a professional and slick establishment. In her position, Wendy reports to the shareholders, her chief role being to oversee the nursing, housekeeping, marketing, and activities – the whole A to Z of the centre. Along with her registered nursing staff, Wendy focuses much of her efforts on attention to detail and care of the residents. 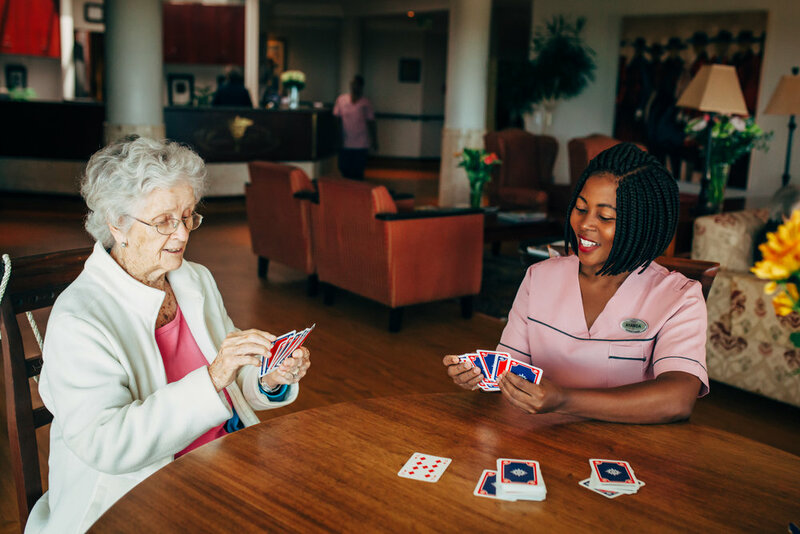 New friendships and being surrounded by fellow residents are two of the main highlights when living at the care centre. Wendy has seen many residents arrive with lost spirits and a rather forlorn outlook on life, but once they have settled, a spark returns to their eyes and new meaning is planted in their hearts. Their days mean something once more and despite the hardships that Father Time loads on all of them, there is much joy in being able to smile again and talk to someone, just to have a person listening and interested in them. The care centre celebrates its 11th year next month (April) and Wendy is rightfully proud of the exemplary reputation they have earned. Having spent years working hard to earn a living and raising families of their own, your aging loved ones deserve a home that cares for them just as much as you do. In the loving, capable hands of Wendy and her team, there could be no better place than Le Domaine Care.